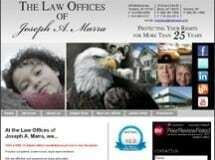 The Law Offices of Joseph A. Marra is located at 25 East 233rd Street, just east of the New York Thruway (I-87) and west of the Bronx River Parkway, across from Woodlawn Cemetery in the Bronx. As personal injury lawyers, we handle cases involving auto accidents, construction, labor law, dog bites and nursing home neglect. If you slip and fall on an icy sidewalk, suffer as a result of Medical Malpractice or are hurt by a defective product, we can help you get fair and reasonable compensation for your injuries and the pain and suffering they have caused. When you contact our firm you will always be treated in a respectful and courteous manner. We listen to you and are attentive to your needs. We provide high-quality legal services. In most personal injury cases, there is no fee unless we are successful in helping you receive fair and reasonable compensation for your injuries. Home and hospital visits - If you are unable to come to us we come to you! When you contact our firm you will receive personal attention, not an assembly-line approach. We listen to you and are attentive to your needs. We provide high-quality legal services. We offer convenient street parking and a free, 15-minute phone consultation. Se habla español.